In any discussion of the hundreds of hidden towers in Florence, I always want to talk about my favorite tower, Torre della Castagna. It’s my favorite because over the centuries it is the one that hasn’t been changed to hide the original purpose of a tower: to defend those inside. 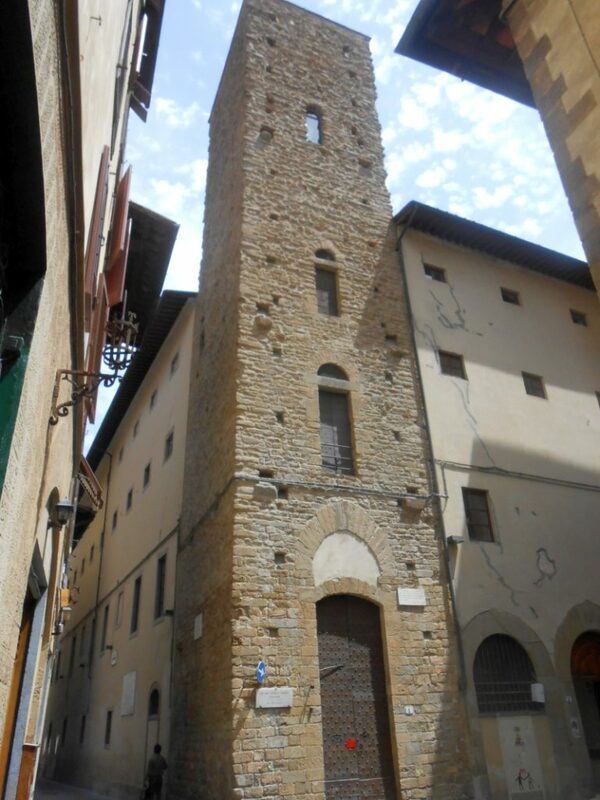 All of the other towers in the city have been altered to add windows and doors, but back when the towers were built Florence was a lawless town, controlled by families and clans that got their way by force. A tower was built to protect a family, clan or political body and at different moments in time the now-named Torre della Castagna performed all of these functions. I can’t find the exact date of its construction, but it must have been sometime between 900AD and 1000AD. 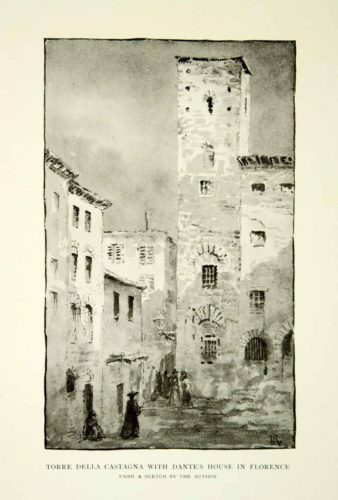 It was first known as Torre Baccadiferrro and protected the Baccadiferro family. It was probably much taller than its present 90 feet (about 29 meters). 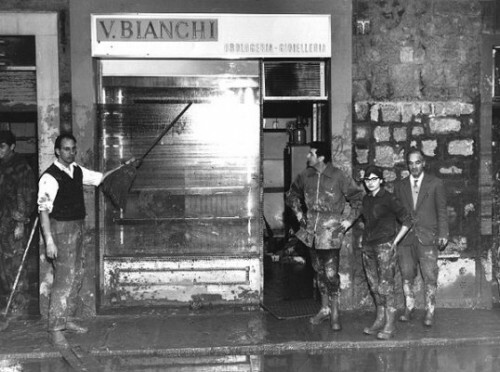 To look at it now (in Piazza San Martino, on the corner of Via Dante Alighieri), it is easy to imagine how dark and cold it was inside. Of course, there were no windows – to prevent burning arrows and other projectiles from entering. Light and air got in through small square holes (now cemented closed to prevent pigeons from entering). These holes were probably covered with tapestries in the winter and left open in the summer. There are no other openings on the north side of the tower. On the west side of the square tower, the observant tourist will notice what look like three tall windows high on the wall over the front, and only, door to the tower. The very observant tourist will also see the protruding “stones” at the bottom of each of these “windows” and guess correctly that the windows are doors and that the stones are the ends of oak beams, now cut short, but once hooked this tower to another. Imagine what it was like to live in a tower. It is tall and narrow and there is little space on each floor. Stairs climbed up one wall of each room. There was no privacy. It was dark, except for the light of lamps and candles. The kitchen and servants’ quarters were probably at the top so that if the kitchen burned up the rest of the tower wouldn’t go with it. 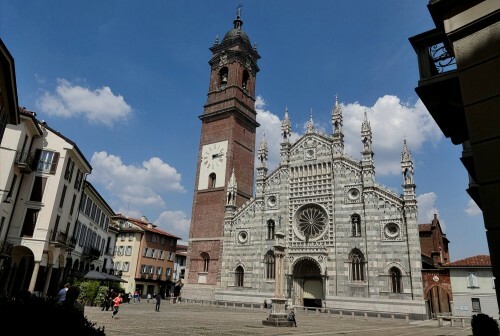 Sometime around 1038, the Torre Baccadiferro was given by the Holy Roman Emperor Corrado II to the Benedictine monks of the adjacent Badia Fiorentina in order to help with the monastery’s defenses. In 1282 the tower became the meeting place of the Priori delle Arti of Florence. The Priori delle Arti was the governing body of the Florentine Republic. Its members came from all of the major guilds (Le Arti), such as those of the woolmakers and merchants, the bankers, the magistrates and notaries, and the silk weavers. During this “interesting” election cycle in the U.S., it is appropriate to note that the word “ballot” comes in to common usage because of the Priors. They use a voting system similar to the modern-day ballot, but instead of slipping pieces of paper in a box, the Priori delle Arti used chestnuts and cloth bags. When Florence became a free city in 13th century and a republic was founded, all towers were cropped to signify that the age of clans and civil wars was over and to give precedence to the Duomo and the Palazzo Vecchio. Florentine historian Giovanni Villani (1280-1348) wrote in his history of Florence, Nuova Cronica, that in 1251 the city government decided “all towers of Florence – and there were in big number with a height of 70 meters – to be cropped down to 29 meters or even less; the stones from the cropped towers were used to build houses in Oltrarno.” It was probably in preparation for the habitation (and name change) of the tower by the Priori delle Arti that it was shortened to 29 meters. 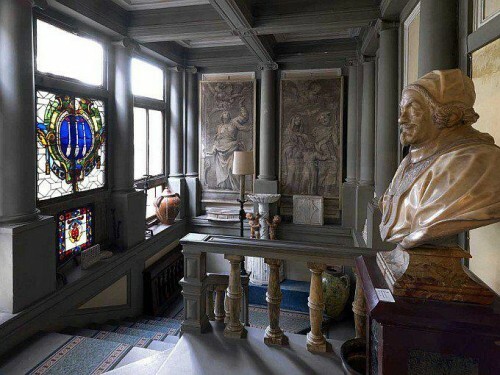 Visitors to Florence can explore inside the Tower of the Chestnut on Thursday afternoons because the bottom three floors of the tower are now the Garibaldi Museum (open from 4pm to 6pm). 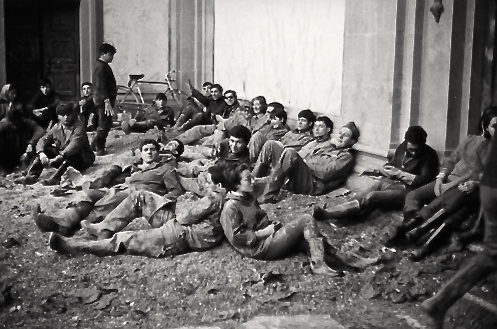 The museum is devoted to Giuseppe Garibaldi and the veterans of the movement for the unification of Italy over 150 years ago. Flags, clothes, photos, portraits, furniture, guns and so much more from Garibaldi’s Redshirts can be found in this quirky exhibit. I am also a fan of all things Garibaldi, which can be seen here, here, and here. And I set my short story Cats of Florence in the museum and the tower. 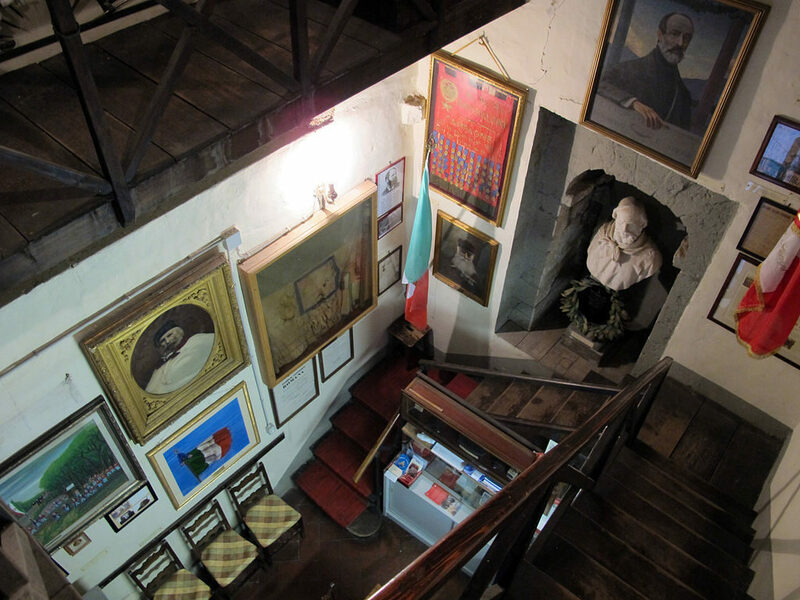 Of course those who love towers and could care less about Garibaldi, get a chance by visiting the museum to imagine what living inside a medieval Florentine tower was like. Climb the stairs, imagine how the rooms would be furnished, think about what living without privacy would be like, and how hard it would be to carry everything up and down the stairs of a 120 foot tower, the work of servants for medieval nobility. 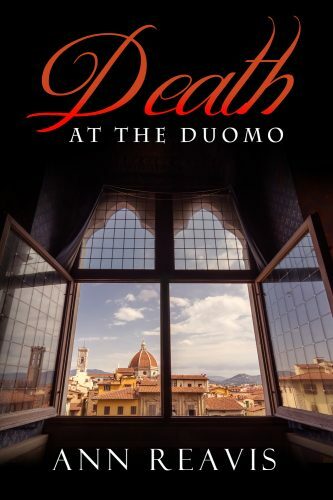 Death at the Duomo is the first book, just released, in a new series of mystery/thrillers set in Florence, Italy. The Renaissance City’s fictional murder rate is about to rise, requiring the pairing a young Florentine detective, Caterina Falcone, half American, half Italian, with Max Turner, an agent from the American Embassy. 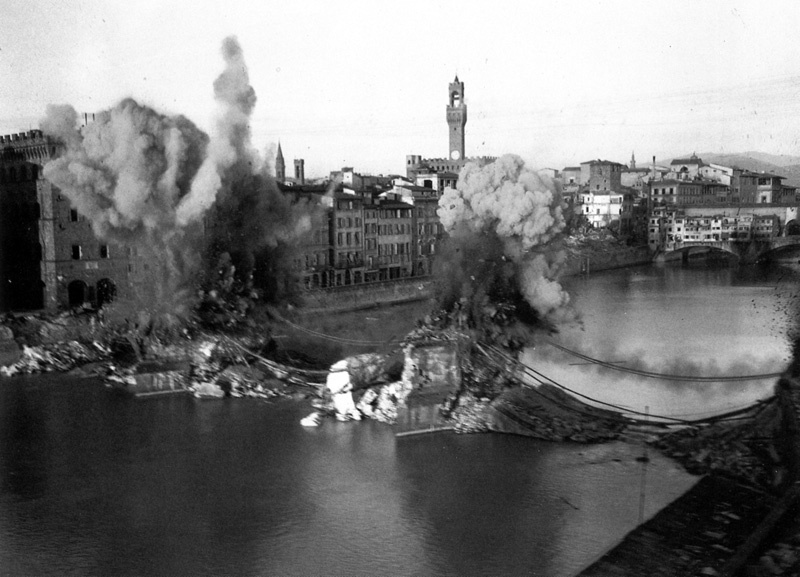 The first novel begins with an explosion outside the Duomo on a festival day. Where did you get the premise for Death at the Duomo? I love mysteries of all kinds, but especially those set in countries not my own. My favorites are by Donna Leon, Fred Vargas, Jason Goodwin, Daniel Silva and Joseph Kanon. 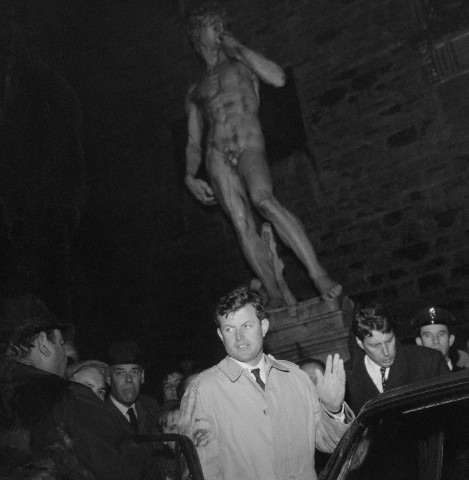 After I had lived in Florence for a few years, I kept discovering places or events that I thought would be perfect for a murder. 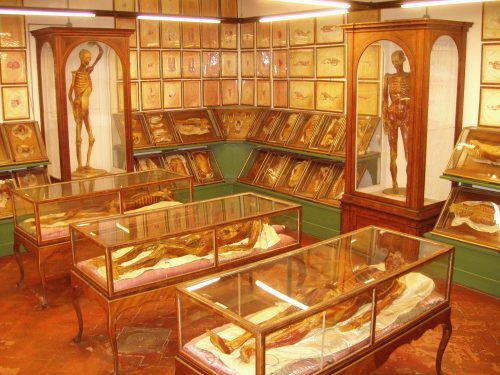 One was the exhibit of anatomical waxes at the La Specola Museum (the site used in the upcoming Caterina Falcone mystery) and another was Scoppio del Carro (literally, the Explosion of the Cart), the event at the beginning of the first book. 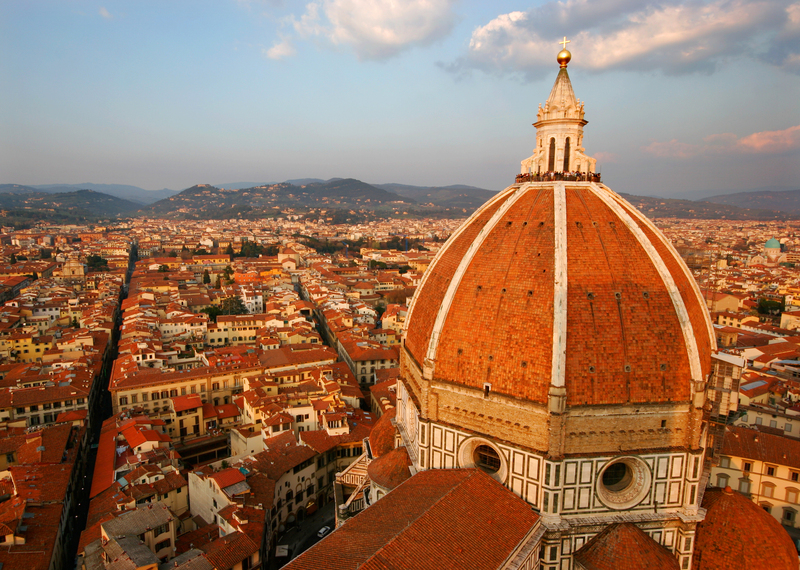 With the colorful history of Florence there are unending possibilities for intriguing plots. Do you prefer to write a novel or a non-fiction book? I started Tuscan Traveler to keep my writing “up to snuff”. 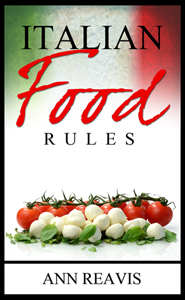 The website provided the basis for my first books, Italian Food Rules and Italian Life Rules, as well as giving me bits of information for my touring clients. 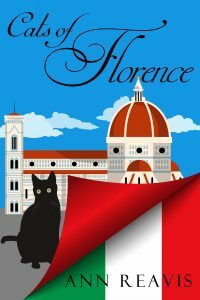 I found, however, that it was more fun to incorporate the scenes from Florentine life, information about Tuscan food, and tidbits from historical Florence into a novel. So I gave Caterina Falcone a father who is a chef and restaurant owner. I learned that FBI agents are stationed at most US embassies, but have restrictions placed on how they operate in foreign countries, and Max Turner came to life. I especially enjoy exploring the experiences, good and bad, of foreigners when they encounter the Italian food and life rules, so each of the mysteries will involve tourists and expats in Florence and Tuscany. What was the best part about being a writer in Italy? I have a great group of writing friends who meet two times a year in Matera, a fascinating town in the Basilicata region. In the spring a small group meets for a brainstorming session. 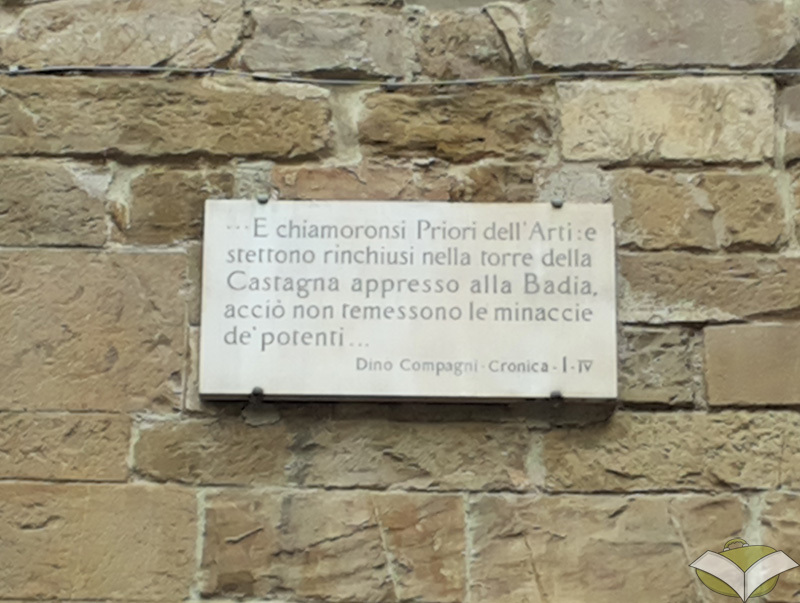 Death at the Duomo was born there. 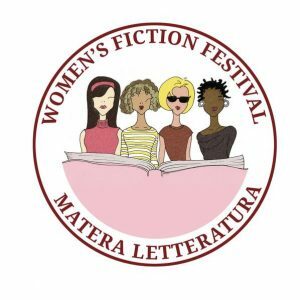 In the fall the Women’s Fiction Festival takes place. The second year I went the speakers included experts in forensics, cyber-crime and investigations of international crimes. The third or fourth edition concentrated on food writing. Recent years have been rich with information about indie publishing. Every year, literary agents and editors from major publishing companies are available for pitches from authors and staff panels on what’s new in the world of publishing. Are you going to write a memoir about your sixteen years in Italy? No. Others have written much better books than I could, ranging from the more standard “under the Tuscan sun” narratives to innovative memoirs, such as Dianne Hale’s two books on language and Mona Lisa. What are your favorite Italian-theme books? Besides my own, I would pick any book by Donna Leon, The Tigress of Forli by Elizabeth Lev, any book by Beppe Severgnini, The Venus Fixers by Ilaria Dagnini Brey, any book by Conor Fitzgerald and Medici Money by Tim Parks. Other books that I like can be found here. For years I told friends and family that the Duomo of Florence was called “duomo” because of the dome. Finally, because I was confused by the fact that Milan’s Duomo didn’t have a dome, I did the research. I was mistaken or just completely wrong. Even the U.S.-based National Geographic got it wrong: “The Basilica di Santa Maria del Fiore (Saint Mary of the Flower), nicknamed the Duomo after the enormous octagonal dome [emphasis added] on its east end, is the cathedral of Florence, Italy, and, arguably, the birthplace of the Renaissance.” There are two problems here. First is the duomo/dome mistake. And while Santa Maria del Fiore is a basilica, it is not one of the four major basilicas (see below), and should probably be designated as the Cathedral of Santa Maria del Fiore. 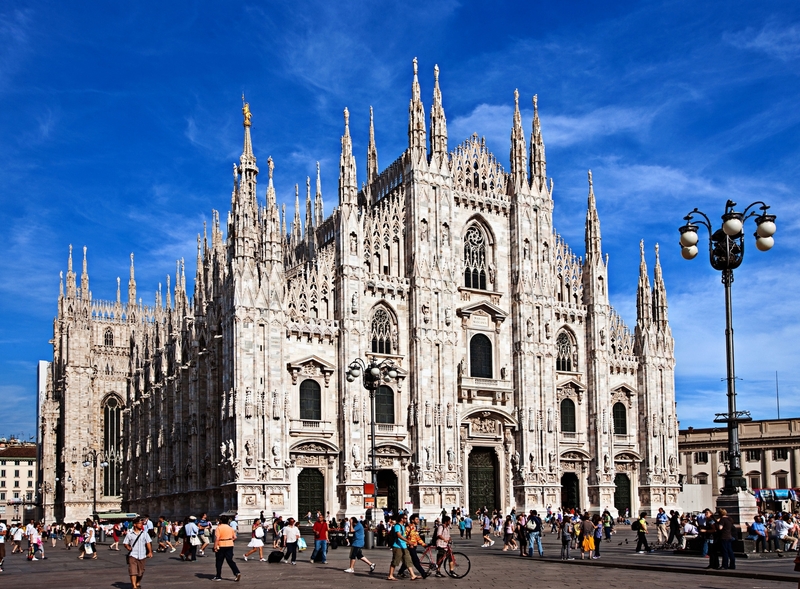 Usually, “Duomo” is a term for an Italian cathedral church (or a former cathedral church). Italian for cathedral is cattedrale. To be designated a cattedrale, the church must have a bishop and a bishop’s chair (cattedra). But to make it more difficult, some, like the Duomo of Monza, have never been cathedrals, but are old and important. According to the Oxford English Dictionary, and to Lo Zingarelli, the main Italian dictionary, the word “duomo” derives from the Latin word “domus“, meaning “house.” In ancient Rome, the domus was the type of house occupied by the upper classes. It could be found in almost all the major cities throughout the Roman territories. The modern English word “domestic” comes from Latin domesticus, which is derived from the word domus. After the fall of the Roman Empire, Latin was spoken only by members of the clergy, and so domus started to be used to address the “house of God.” A cathedral is considered the “house of God” or domus Dei and “house of the Bishop” or domus Ecclesia. The most important church in each city is often called Duomo followed by the name of the city; for example, Duomo di Milano or Duomo di Firenze. 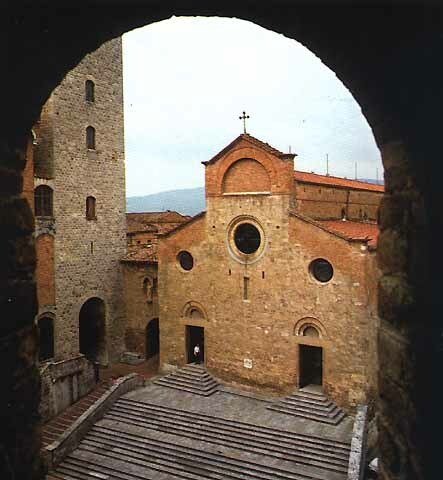 This can include small towns, like San Gimignano in Tuscany, which also has a duomo, but wasn’t a cathedral, and the Duomo di Volterra, which was a cathedral with a bishop. There is, however, no church in Rome known as the Duomo or even, a duomo. Again, having nothing to do with “duomo” or “domus”, the dome of the Florence Cathedral is known in Italian as the “cupola”, as it is for any dome on any Italian church. Consisting of two interconnected ogival shells, the Duomo’s octagonal cupola was erected between 1420 and 1434 to a design of Filippo Brunelleschi. His innovative approach involved vaulting the dome space without any scaffolding by using a double shell with a space in between. The inner shell (with a thickness of more than two meters) is made of light bricks set in a herringbone pattern and is the self-supporting structural element while the outer dome simply serves as a heavier, wind-resistant covering. The cupola is crowned by a lantern with a conical roof, designed by Brunelleschi but only built after his death in 1446, while the gilt copper sphere and cross on top of the lantern, containing holy relics, was designed by Andrea del Verrocchio and installed in 1466. The Basilica was a Roman public building, a sort of tribunal. (The term basilica comes from a Greek word meaning regal or kingly.) When the ancient Romans spoke of a basilica they were referring to a large, high-ceilinged hall with three long aisles. In the centuries after the Roman Empire, the term basilica started to mean “big church,” because the first big churches were built in the style of the old Roman basilicas. Some architectural elements that you can often find in a church (for example, columns, apses, naves) were already present in pre-Christian Roman buildings. Nowadays, many of the main churches in Italy have the formal name of Basilica followed by the name of a saint; for example, Basilica di San Pietro (in Rome), Basilica di San Marco (in Venice). Over the centuries, the Popes have awarded the title “Minor Basilica” to churches that had unusual historical significance, or were especially sacred because of the presence of a relic or relics. 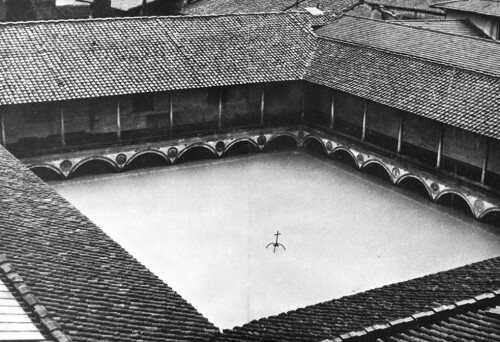 There are over 1400 minor basilicas around the world, 527 just in Italy alone. These honorary basilicas include the great church at the Grotto in Lourdes, the Cathedral of St. Mark in Venice, the Shrine of Ste. Anne de Beaupré in Quebec, and the National Shrine of the Immaculate Conception in Washington, D.C. The designation Major Basilica is restricted to the four greatest churches in Rome St. Peters, St. John Lateran, St. Mary Major, and St. Paul-Outside-the-Walls. 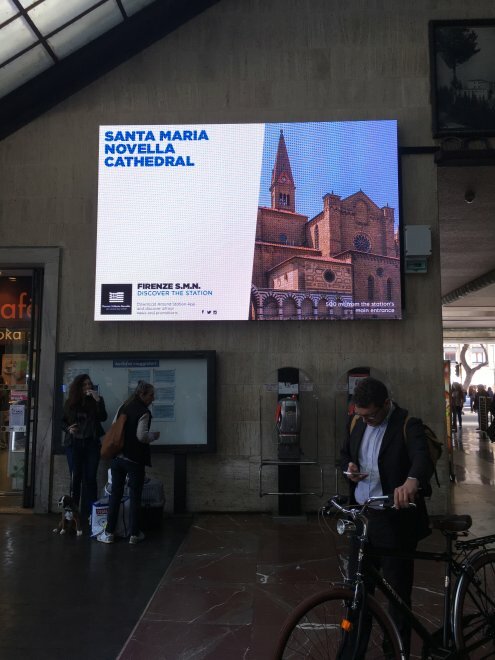 Update: During the week of 10 April 2016 the news site of La Repubblica Firenze reported that the tourist information signs at the central Florence train station had misidentified the Church of Santa Maria Novella as the Florence Cathedral. Florence’s cathedral museum, known officially as Museo dell’ Opera di Santa Maria del Fiore (Museum of the Works of the cathedral of Santa Maria del Fiore), hosts the world’s largest collection of Florentine Medieval and Renaissance sculpture. It reopened to the public on October 29, just in time for Pope Francis’s visit, after an expansion and renovation project lasting two years. The 45 million euro project was funded by the Opera di Santa Maria del Fiore, and was design by Adolfo Natalini and Guicciardini & Magni Architects. 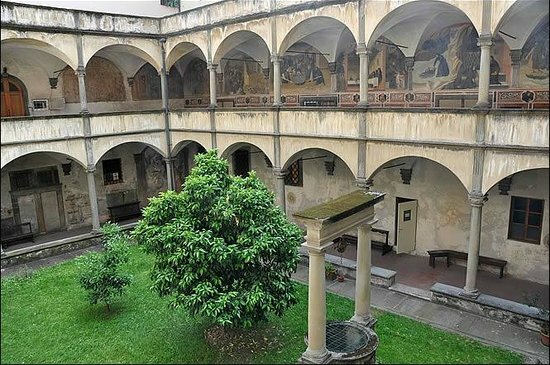 The museum is the anchor for what is known as Il Grande Museo del Duomo, which also includes the Duomo, the Campanile (Giotto’s Bell Tower), the Cupola (Brunelleschi’s Dome), the Baptistry, and the Crypt. Known more simply as the Opera del Duomo or Duomo Museum, it now contains over 750 marble, bronze and silver sculptures and reliefs, including works by Michelangelo, Donatello, Arnolfo di Cambio, Lorenzo Ghiberti, Andrea Pisano, Antonio del Pollaiolo, Luca della Robbia and Andrea del Verrocchio, among others. 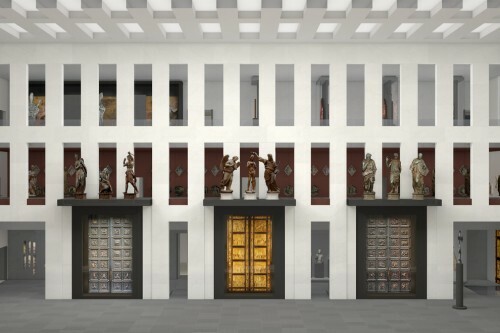 The museum displays the original artworks that have been removed from their positions from the façades of the Duomo, Bell Tower, and Baptistry (thereafter replaced by copies) or taken out of daily liturgical use, either for conservation or modernization. 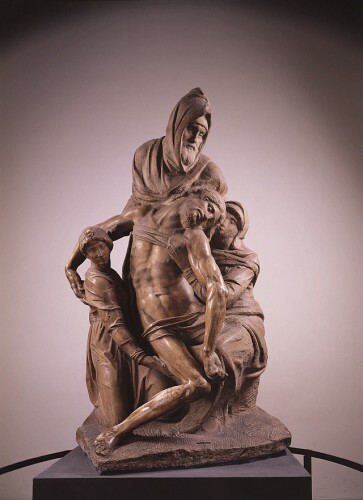 New displays effectively highlight Donatello’s Maddalena, sculpted in wood; the original bronze doors created by Lorenzo Ghiberti for the Florence Baptistry, known as the “Doors of Paradise”; Michelangelo’s unfinished Pietà; and 27 silk and gold embroidered panels designed by Antonio del Pollaiolo. The Gallery of Brunelleschi’s Dome (1418–36), on the first floor, is one of the most educational highlights of the museum, housing 15th century wooden models including one attributed to Brunelleschi himself, period materials and the tools used to build the dome. The gallery also contains two large wooden models of the Lantern and of the Dome and video provides a virtual view of the building of the edifice. 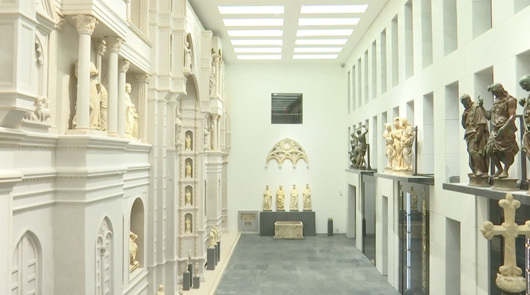 Because the space of the museum doubled in the new renovation, visitors can also see many works previously held in museum storage, including forty 14th and 15th century statues and fragments of the cathedral’s original medieval façade, which are effectively displayed on a full-sized model made of resin and marble dust of the version designed by Arnolfo di Cambio (1296) that was subsequently destroyed in the 16th century and replaced in 1887 by the present façade. The new Duomo Museum project was under creative direction by Monsignor Timothy Verdon. He is reported saying that the biggest problem was “how to exhibit more than 100 fragments of the cathedral’s lost medieval facade, dismantled in 1586-87, forty statues, many monumental in scale, and some sixty architectural elements”. The medieval façade was rebuilt on the basis of an extant 16th century drawing. The grand room is entitled Salone del Paradiso. Monsignor Timothy Verdon was born in the United States (Weehawken, NJ, 1946). He is an art historian with a Ph.D. from Yale University. 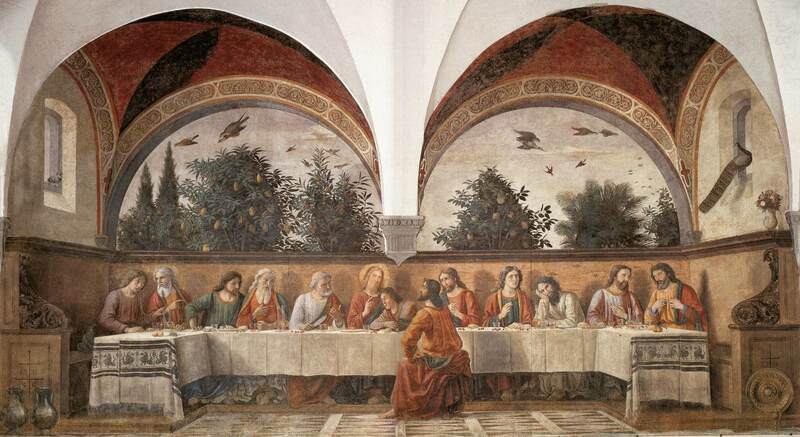 His first interest in Italian art started as a teenager with visits to the New York City Metropolitan Museum. His first visit to Italy was a trip to Venice at the age of 18. He planned to immerse himself in Renaissance art and based his future studies on the use of iconography in Renaissance and Medieval art. 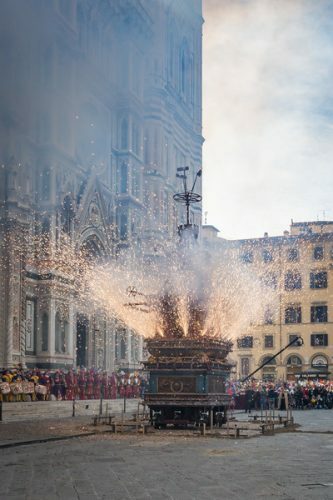 He has lived in Italy for 47 years and since 1994 has been a Roman Catholic priest in Florence, where he directs both the Diocesan Office of Sacred Art and Church Cultural Heritage and the Cathedral Foundation Museum (Museo dell’Opera di Santa Maria del Fiore). 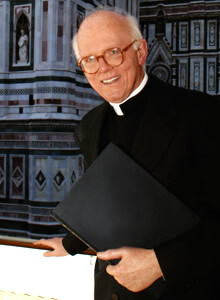 Author of books and articles on sacred art in Italian and English and has been a Consultant to the Vatican Commission for Church Cultural Heritage and a Fellow of the Harvard University Center for Italian Renaissance Studies (Villa I Tatti), and currently teaches in the Florence Program of Stanford University. Monsignor Verdon’s decisions to make this not only a museum containing the past, but to use the communication tools of the present, served to create one of the most relevant museums in Italy for visitors of all ages and interests. The combined ticket for the Baptistry, Bell Tower, Dome, Crypt and museum is €15 (Children 6 to 11, €3; under 6, free). Entry to the cathedral is free. Get a preview of the Museum with a walk through described and photographed by art historian, Alexandra Korey. The website of Il Grande Museo del Duomo has additional videos and photos. National Geographic documentary about Brunelleschi’s Dome. Articles in the Wall Street Journal and NYTimes. 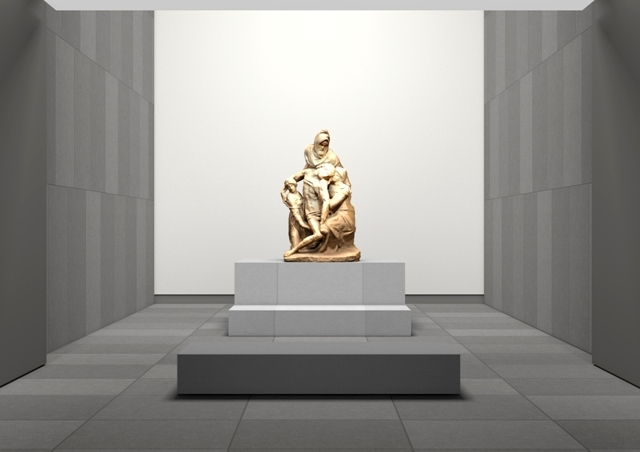 Getting to view the collection of the Museo Bellini, located along the Arno in Florence, takes a bit of work. To understand its history, having some understanding of Italian helps. 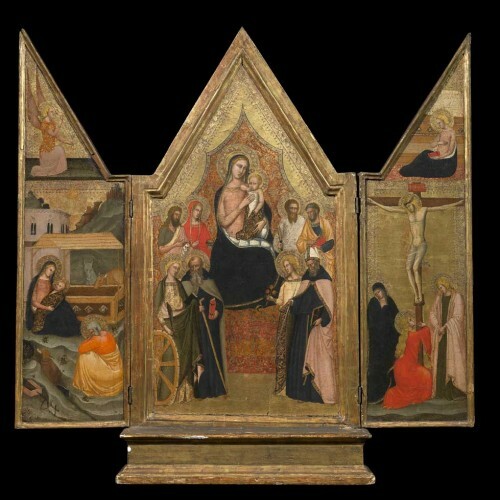 But for a new experience, a tour through the Bellini collection is as memorable, as it is fun. To get in, you start by phoning or ringing the bell. Then make an appointment for a tour and turn up at the appointed time. The fee of 15 euro gets you three visits within a year. As you walk in to the entry hall a mishmash of the ancient and the modern might make you wonder what is ahead. 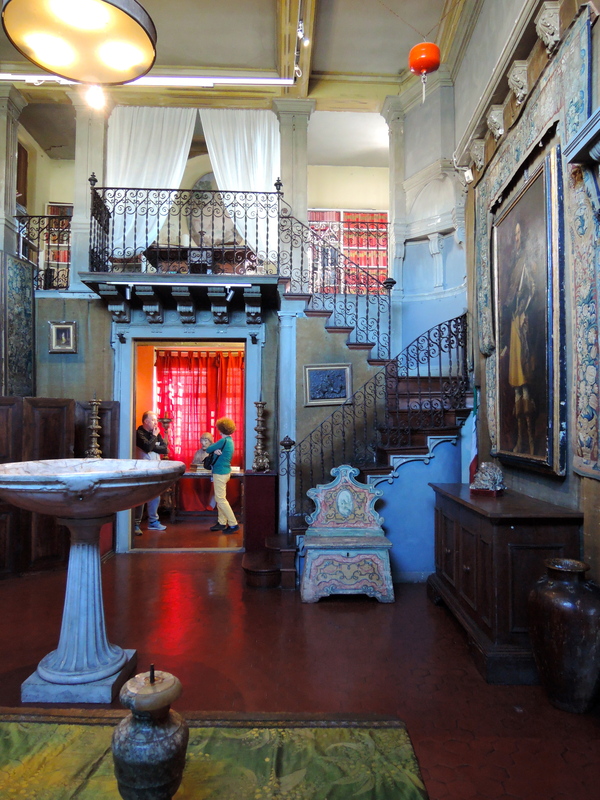 As you climb the stairs you are transported back to the early 20th century when Luigi Bellini, Sr. controlled the collection. It was the practice of antiquarians (Bardini, Contini, Volpi, Romano, Stibbert, Horne) to create “homes” filled with art that they might sell or trade or from which they couldn’t bear to be parted. The Bellini collection has this feel—fourteen rooms of a Renaissance home, but with a few touches that are medieval. The visitor will find here a fresco of the school of Giotto, a bust by Donatello, a portrait by Tintoretto, a Della Robbia Madonna, a bronze by Giambologna, Ceramic from Xanto Avelli Rovigo, a Gothic tapestry, carved-wood Sansovino chest (armadio). Just when you have caught your breath the small doors enclosing a Fra Angelico gold-leafed Madonna are opened. There are ancient tables and chairs, a 19th century couch Luigi Sr. deemed “too modern”, statues, fountains, vases, minature bronzes, reliquies, carpets, and last but not least, a collection of crowns. Even if you don’t understand a word of Italian, the tour is fascinating. Some say that this passion for collecting and selling started in Ferrara with Vincenzo Bellini (1708-1783), who after twenty years as a priest, developed an obsession for ancient coins. He was one of the most illustrous numismatists of his time, even selling coin collections to Austrian Emperor Francis I. His son, Vitaliano, expanded the business into antiques and his grandson Giuseppe moved to Florence and eventually became an antiquarian with a store on Via della Spada. 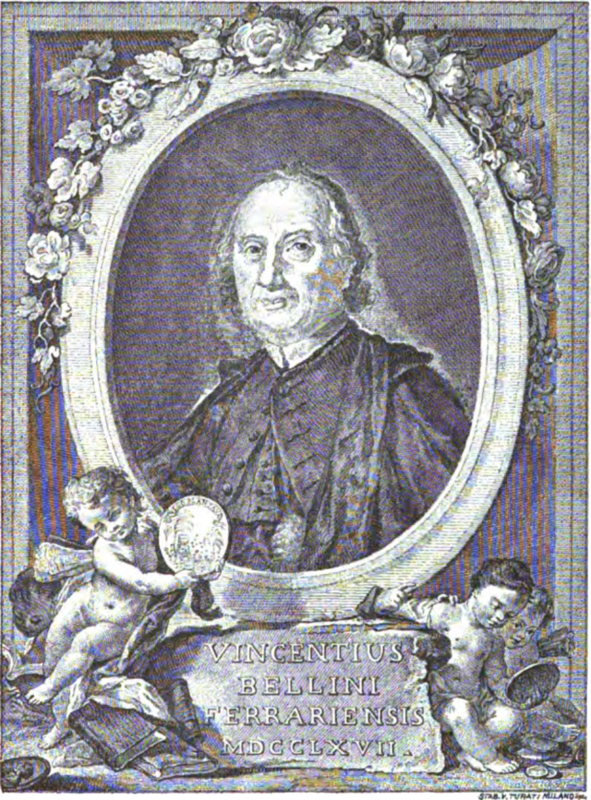 A few generations later the most well-known antiquarian in the family, Luigi Bellini Sr. (1884-1957) was born in Impruneta. At nineteen he took off for New York to make an international name for himself, bringing clients back to the gallery in Florence. 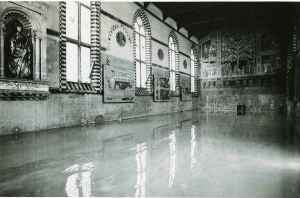 In the 1920s, he moved the business to a more impressive location on Lungarno Soderini, where the museum is today. He needed more room for both his business and his collection. 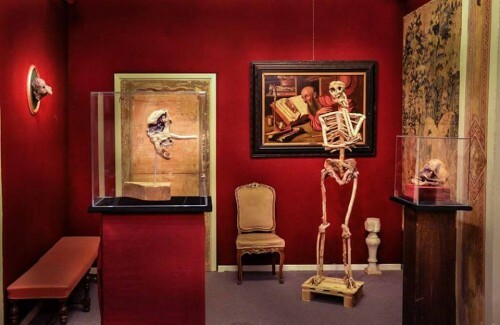 “You start as an antique dealer and end up being a collector without realizing that the germ of antiquity has infected you, it debilitates and consumes you and you will never recover. It is worse than tuberculosis,” he wrote in his autobiography. 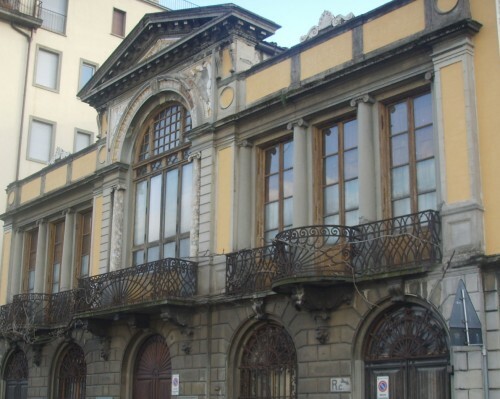 A decade later, in 1931, he acted on his interest in contemporary art by opening a gallery with a couple of partners in Palazzo Spini-Feroni (home of the Museo Ferragamo, which has included pieces from the Bellini collection in its new exhibit). The gallery opened with an exhibition dedicated to the sculptor Arturo Martini and the painter Primo Conti. This venture did not last the test of time. 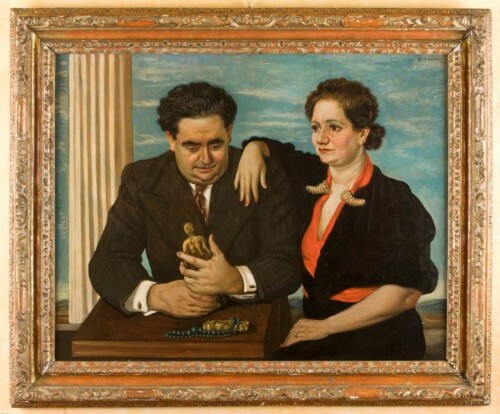 Four years before his death, Luigi was the prime organizer of the 1953 national exhibition of antiques held in Florence at Palazzo Strozzi. It was the precursor of the present Biennial Exhibition of Antiques held regularly at the Palazzo Corsini across the river from Museo Bellini. Luigi Sr.’s grandson, Prof. Luigi Bellini, Jr., and his great-grandaughter Sveva are still active in the Biennial Exhibition, as well as other projects, including Luigi Jr.’s 2004 exhibition entitled “Bellini Collection Presents the Renaissance of Florence” at the Museum of Imperial Ming Nanjing in China. This was the first exhibition at the Imperial Museum to showcase western art. For the past 130 years the Bellini collectors have shared a desire to live the past while at the same time be present in the modern life of Florence. Through the status symbol of their collection and the role of protector of the past, they strengthened their relationship with the nobility of the city while becoming acknowledged experts in private collecting choices and exhibition content. Lugi Sr., who controlled the collection between the first part of the 20th century, was known to believe anything created after the 1800s was too modern to be part of his private universe, but he was happy to support and advise the exhibits at Palazzo Spini-Feroni, which highlighted the works of Giorgio de Chirico, Mario Sironi, and Filippo de Pisis. Today Sveva Bellini produces exhibitions in the ground-floor exhibitions space introducing the most modern of Italian artists. 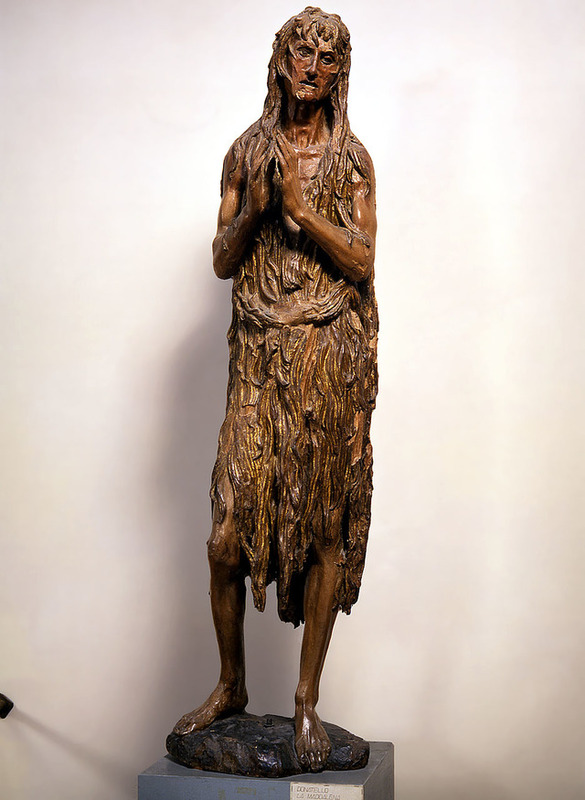 The present exhibit with free entry, on display until June 4, is called Woodenkammer: Ogni Forma é Nella Natura. Sveva, however, does not disturb the evocative collection on the primo piano of the the palazzo that invokes the passion of her great-grandfather, and generations before him, with rooms of ancient artworks styled in homage to earlier centuries. 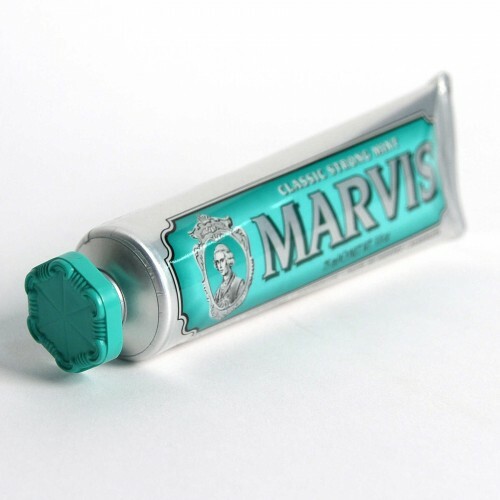 The masterpieces, the everyday objects and the walls and stairs are history revived, reaching into the present. The best bookstore for visitors to Florence, the Paperback Exchange, just got a fascinating new book. 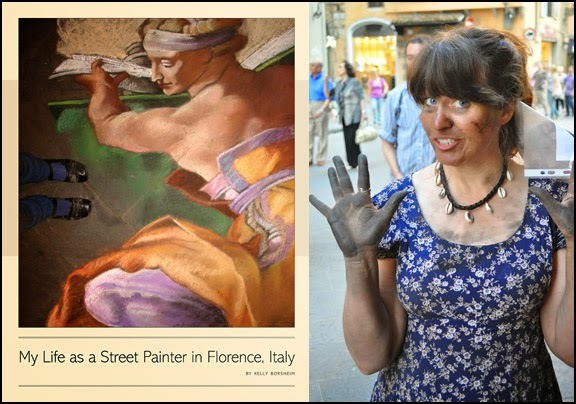 The title tells it all—My Life as a Street Painter in Florence, Italy by Kelly Borsheim—and for any visitor to the Renaissance City it sheds light on a little-known artistic lifestyle, that of the madonnari, those who work with chalk and pastels on three large squares of paving stones between Piazza della Repubblica and the Ponte Vecchio, bringing well-loved paintings to “life” for a mere twenty-four hours. 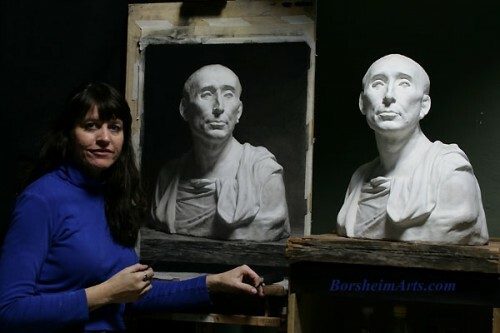 Kelly, a sculptor with a studio in Texas, came to Florence just in time to fulfill a lifetime goal of seeing Michelangelo’s works before she turned forty. A few years later she joined an organization of pavement painters. (They are licensed by the city and pay for the privilege of using the designated spaces.) Her fascinating book contains hundreds of photos and the story of the little understood group of artists who have thrilled and amazed an audience of thousands of bystanders through the years. You visited Italy for the first time in 2004 and in 2011 you published a book with the intriguing title My Life as a Street Painter in Florence Italy. 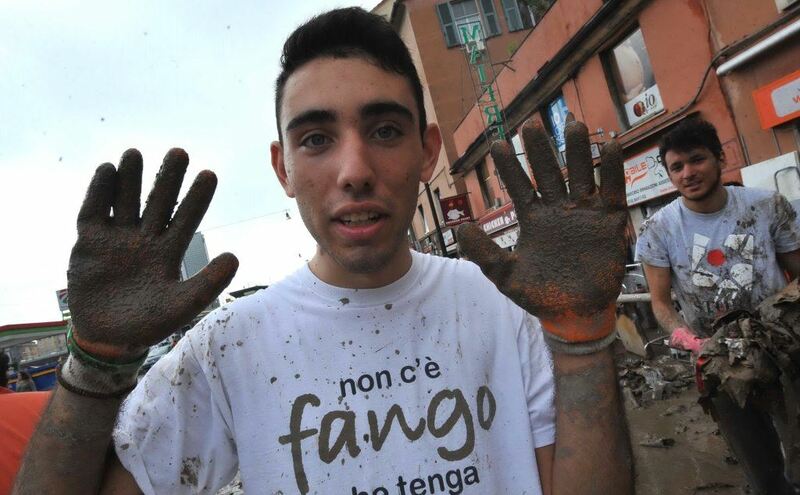 How did you go from being a tourist to joining the small community of madonnari in Florence? I backpacked around Italy for six weeks in the summer of 2004 and I fell in love with Anacapri and Florence. I decided to find a way to come back and stay for a longer period of time and returned to the Renaissance City as a student in the fall of 2006. 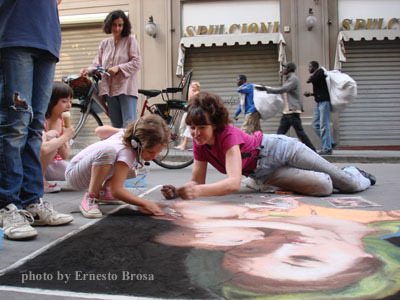 In early 2007, I met another student who created street paintings as part of the organization of madonnari (street painters) in Florence. She invited me to attend one of the meetings. Shortly after that, I returned to my home and studio in Texas. When I came back to Florence that fall, I went to Via Calimala where the street painters work and spoke with Claudio, the head of the organization. He had been instrumental many years before in having the city create three large squares on that street, consisting of street stones smoother than normal and outlined in brass. I was given a space on two different days in September while the senior madonnari were on holiday. Could street painting be considered performance art? What are the skills that make a successful street painter? 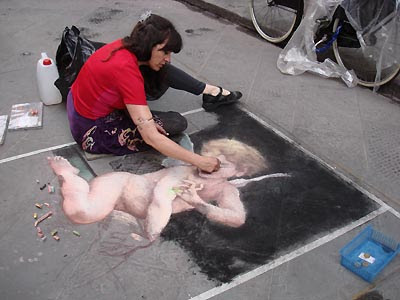 Yes, street painting is more of a spettacolo, a performance. Timing is important. I learned a bit about what to do and when to do it in order to help the passersby envision what I was trying to accomplish, whether or not they would be able to return to see progress later. We work large; we work fast. The idea is to create a “Wow” impression in one day. Like any performer: the more skilled we are, the better the show. Florence has an established group with most artists being fairly competent. I found that my having some drawing experience already made it easier to adapt my current skills to working large and in color, as well as working on a horizontal surface and in front of an audience. Physically, the work is very difficult and more tiring than anything created in a vertical position. The history of madonnari is a bit unclear, but it seems that they were never really a part of the traditional atelier system that fine artists/professional artists were. There is a school for madonnari in Napoli that I believe was started by Gennaro Troia. The madonnari in Firenze have come from diverse backgrounds (and countries). 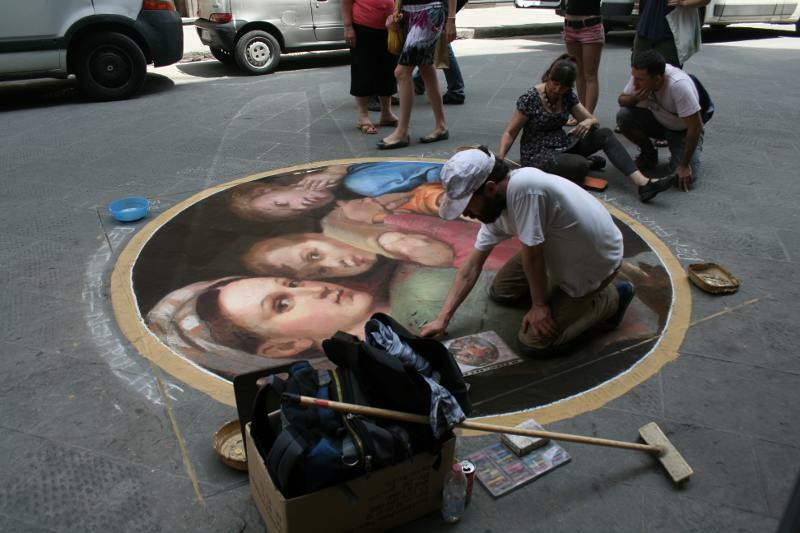 Often they are art students temporarily in Firenze and working alongside master street painters. Where else in Italy are there communities of street painters? 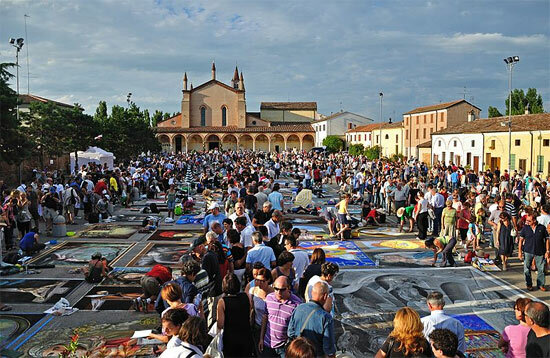 Are there street art festivals? 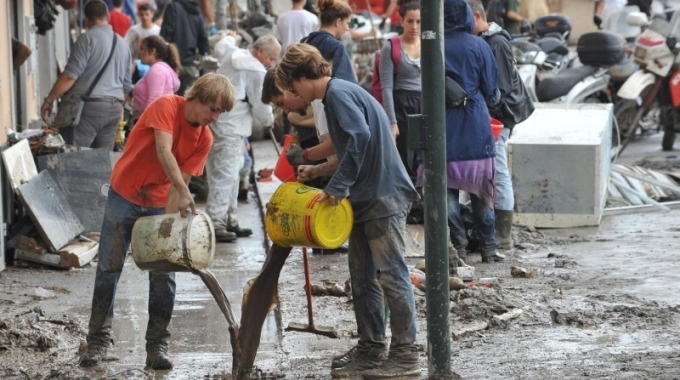 I do not actually know if there are communities of madonnari, per se, or at least organizations such as we have in Florence. The madonnari mostly know one another because of the festivals. I have to say that I was thrilled by how so many of them welcomed me into the fold. I find so many in this community, either in person and on Facebook, to be wonderfully supportive of one another. Yes, there are festivals and they are grand! I wrote about the two in Italia that I have attended: one in Nocera Superiore in southern Italy, not so far from the Amalfi Coast (in May) and the competition on Ferragosto (August 15) in Grazie di Curtatone in north central Italy. And there are other festivals in Europe and the US, perhaps in other countries. You were a sculptor when you came to Italy. 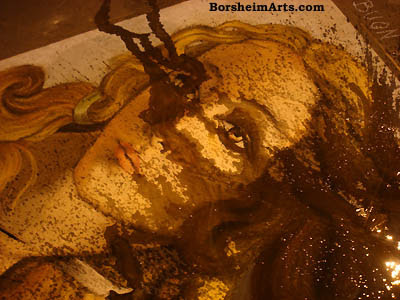 What are you working on now and how did your street painting experiences inform your present endeavors? I am still a sculptor and I am in the process of finding a home in which I can start working with stone on a daily basis again. I have been lucky in that some Italian sculptors invited me to participate in a symposium to carve stone in Tuscany two summers ago. That led to my going to Bulgaria for a similar event last summer. Currently, I am working on several figurative paintings. This summer I will return to Texas to carve some of the stone I left there. I hope to be back in Italy this fall. Drawing is the basis of all of the visual arts. Drawing and painting helps my sculpting, and vice versa. Before I began street painting, I had little experience with color. The sense of touch is far more important to me. 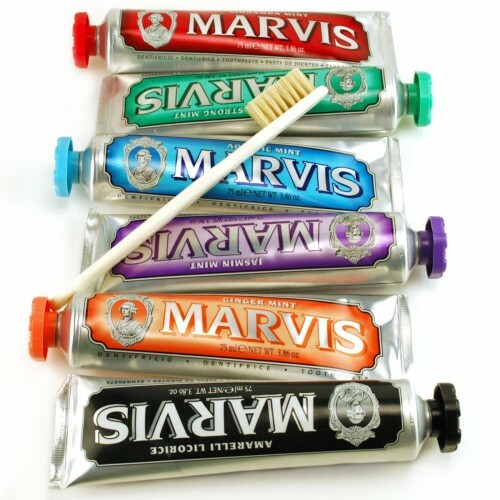 However, I enjoy pastel art. I also wanted to work large and street painting was great training for my first mural as an adult. In 2012, I designed and painted a mural (400 x 200 cm) for a collector in Caprese Michelangelo. I was thrilled since this little village is the birthplace of the great sculptor. I would love to create more murals! 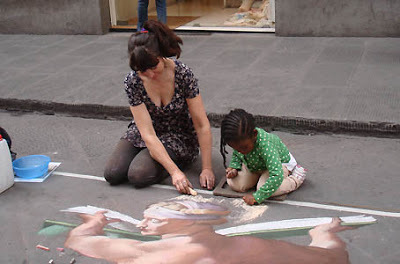 In Florence, street painting is creating copies of masterworks. I learn best through the sense of touch. 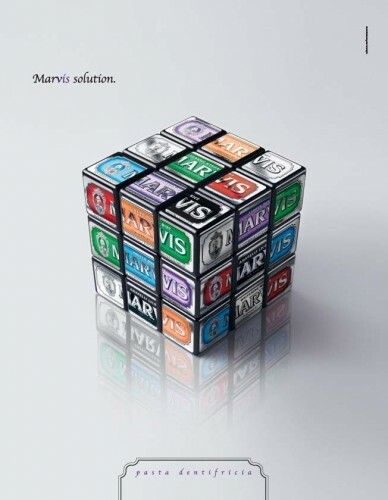 So, through the copies, I was able to understand how great artists solved problems of design. I am not sure that I would have allowed myself as much of the luxury of learning from copy work if I had not been working as a street painter. What question haven’t you been asked about your book or your life in Florence that you wish someone would ask and what is your response? I have been called “The What-If-Girl” by friends. I can imagine all sorts of things. And yet people still surprise me. I want to change the world, but I have not yet figured out how. The life of an artist is rarely easy, but the Internet has opened doors never before available to the majority of us. Musicians and authors are reported to have used the Internet to change the dynamics of getting their work in the hands, ears, and eyes of new fans and outside of middlemen and normal distribution routes. They are often in direct contact with those that love what they do. Painters and sculptors create art that is not so downloadable, nor available for a low accessible unit price as a digital artist. Even giclée fine art reproductions cost the artist much more than the individual cost of a digital book or album. I would like to find a way to get fine art into the lives of more people without actually giving it away. Or, I would not mind giving it away if an artist could still find a way to have a long-term place to live (of his choosing) and not want for food or other things that people choose to have in their lives (travel and even our own art collection!). 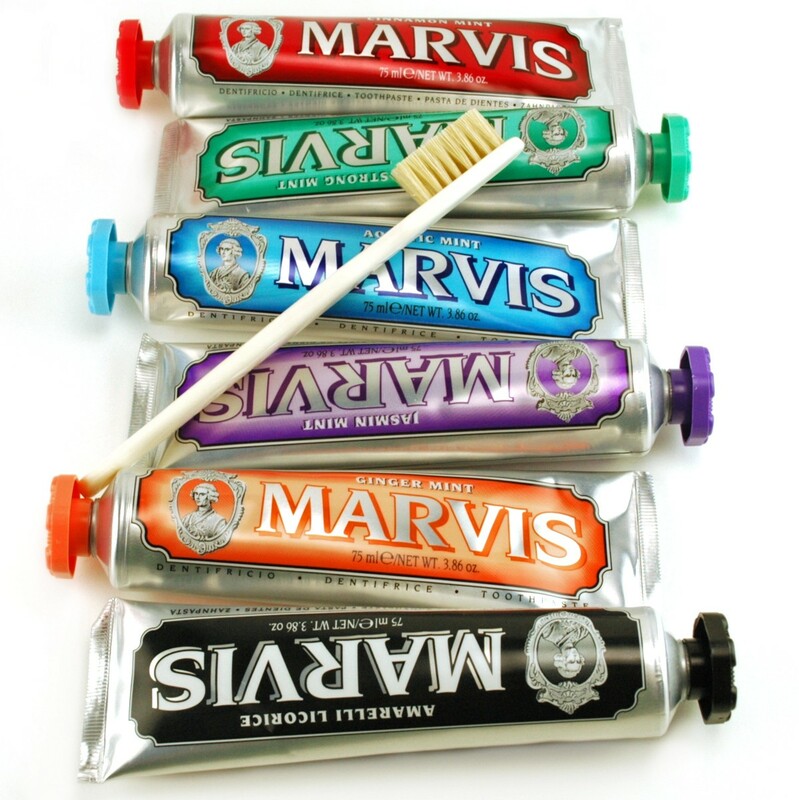 Unless a work of art is a commission, the artist must find a home for her creation. In 2001, I met my mentor, Vasily Fedorouk. He introduced to me the world of stone carving symposiums. Here is how it works: A community or group of people get together and decide that they want a handful of large garden-size sculpture for a public art garden. They buy or have donated some large pieces of stone. They organize the workspaces for artists and they chose these artists, sometimes by jury, others by word of mouth. This group provides to the artists the electric power to each carving site, the air compressor and hoses, tables, tents or lots of trees for shade, and of course the work site itself. They also house and feed the artists for the duration of the symposium, which can last anywhere from five to 30 days. They pay each artist a stipend so that he may pay his own living expenses back home, as well as for his travel. The artist creates a specific design, gives his desired dimensions of the stone to the symposium organizers, and brings all of his own individual tools. And he works and works until he is done or the time is up. And the community? If they did a good job of it, they created a work site accessible to tourists and locals so that everyone could watch the art evolve. They received an “instant” sculpture garden for a lot less than any other means of acquiring large original artworks in stone. They may later place their new sculpture wherever they like, usually on a permanent display. This helps the community build a tourist destination. It is an investment that improves the quality of life for all the citizens. As for the street artists of Florence, I have not figured out how they pay their bills. Madonnari work for tips, but the ones I know have other means of income and it is still a difficult life. The world needs more beauty (and less graffiti/tagging). I am grateful every day. I do not earn enough in art sales alone but I am quite fortunate in many ways. I know that my artistic life is made possible by every single person who treats me to a meal, gives me a place to sleep when I am traveling, shares useful information with me, makes me smile, makes me think, says a kind word about my work to someone else, and helps me in any number of ways. I work a lot to not disappoint while I follow the individual path that I must travel. But I still want to find a way to change the world . . . and not be living on the street. Kelly Borsheim’s book My Life as a Street Painter in Florence, Italy is available at Amazon.com. 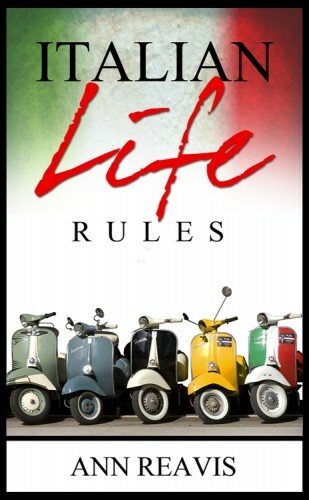 Tuscan Traveler’s Tales – Italian Life Rules Has Launched! At the beginning of 2014 I was so excited to hold my newly published book, Italian Food Rules, in my hands. I was even more pleased as the book was bought up by readers in bookshops in the US and Italy, ordered online in those countries and many more, and downloaded digitally anywhere a wifi signal could be found. Many of the “rules” had first seen the light of day on TuscanTaveler. “Don’t Dip Bread in Olive Oil” has been the most controversial and received the most comments. “No Cappuccino After 10am” runs a close second. 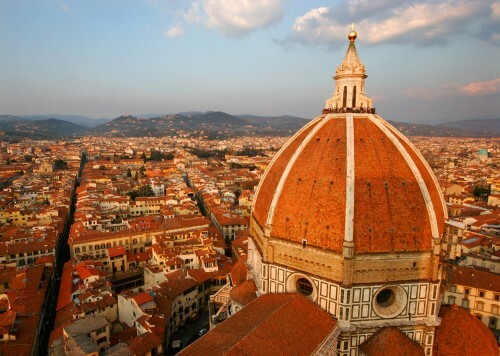 Some readers used Italian Food Rules in preparation for their 2014 vacations in Italy. 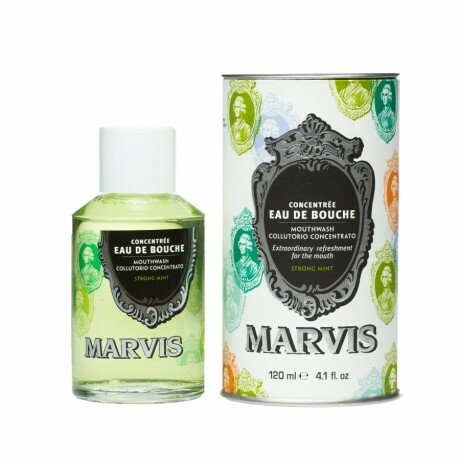 Other people bought it as gifts for friends who were traveling to the peninsula. College students in Florence took a copy home to show their parents what they had to learn to “be Italian” for a semester. Expats in Tuscany put a copy on the bedside table of friends who were visiting, hoping to pass along the “rules” in a subtle way. Those long-time Italophiles got copies for themselves and more for friends to enjoy the memories of what is one of the most special and memorable aspects of Italy–the food. Now, I am please to announce that almost a year later the companion book to Italian Food Rules has been published. Italian Life Rules is available this week from online vendors, both in digital and print versions. Soon it should be available in bookstores in the US and Italy, either on the shelves or by request. Some of the Italian Life Rules have also made their appearance in TuscanTraveler. The most popular are those about Italian superstitions and the “joys” of going to the post office in Italy. The mysteries of “Ciao” have been explained and the confusion of kissing the other cheek has been highlighted. The Renaissance beginnings of the Italian Life Rules has interested many readers. As the holidays approach, I hope you have some quiets time in a comfortable chair in a warm corner, perhaps in front of a crackling fire, and that there is a copy of Italian Food Rules and a copy of Italian Life Rules to entertain you and give you a sense of being Italian for an hour or so.